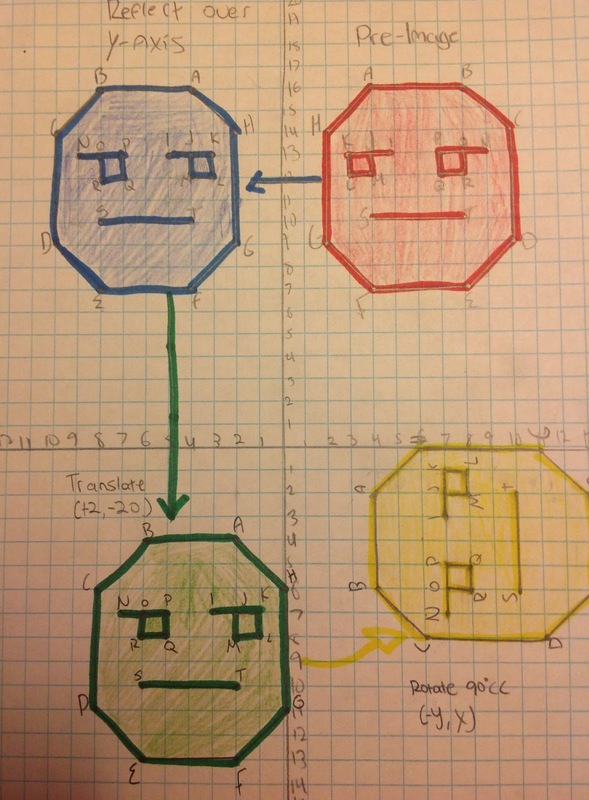 My pre-algebra classes just finished their unit on transformations. They loved the graphing and finding something that 8th graders love to do right before winter break is worth its weight in gold! 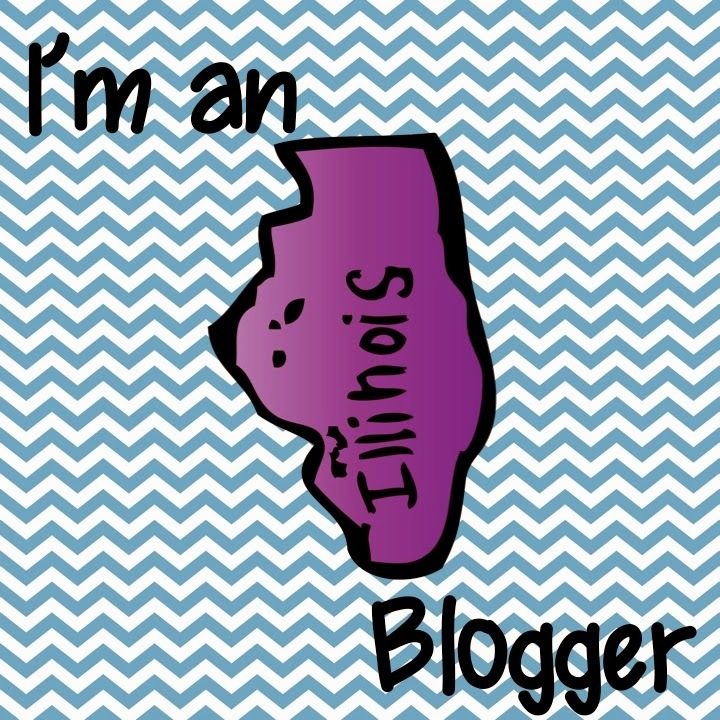 I found a mini-project that Pam at pperfectsquares shared on transformations. When I saw it, I knew I wanted to make it a summative assessment for my students. So I added a few things to Pam's mini-project and I think turned out to be a great assessment for my kids. 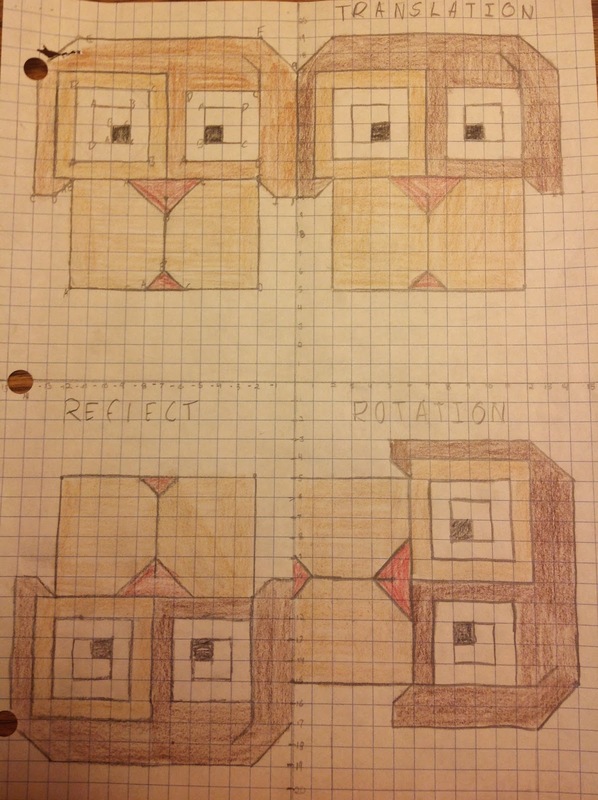 Their homework the night before was to create the picture and write down the ordered pairs. I didn't tell them it was going to be part of their assessment so those that did their homework had a head start. Your summative assessment for transformations will be an in class project. You will need to draw a pre-image of a picture that has 10 or more points. The pre-image should have detail to it and not just be a picture of a shape or letter like we did in class. 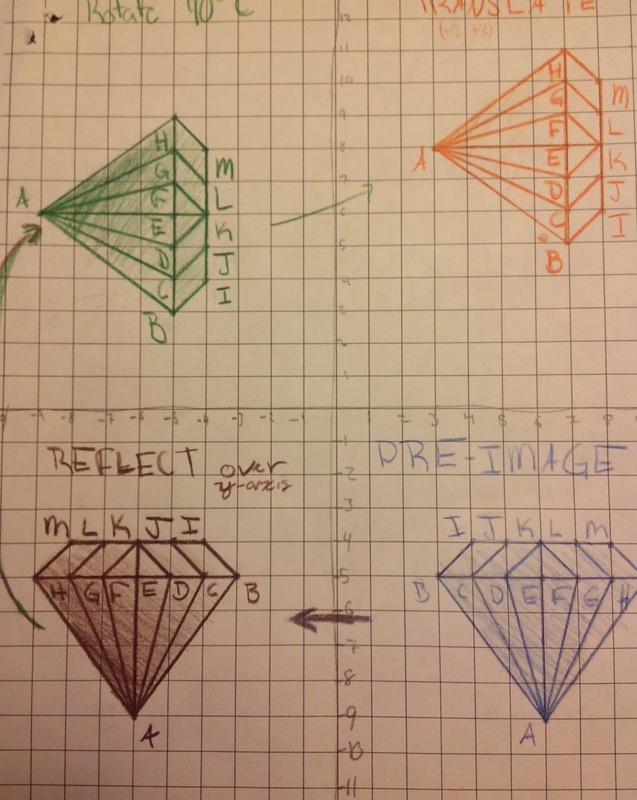 Your pre-image should be completely inside one of the quadrants on the coordinate plane. It does not matter which quadrant you start in. It is your choice. Use your imagination when deciding on a picture and impress me! Draw you pre-image and place points at all of the vertices. List the points and ordered pairs on the transformation summative activity chart. Next you will accurately translate, reflect and rotate your image. You may do this in any order that you want. All points should be listed accurately with a title above it so I can determine if your transformations are correct. 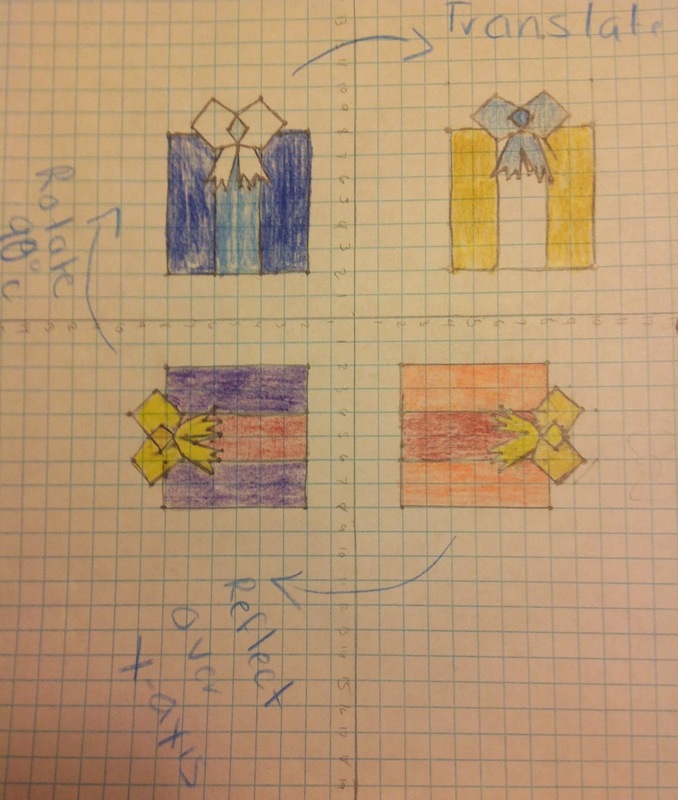 Each image should have an arrow showing the direction that the image is moving,(remember we drew arrows), as well as color coding the image and ordered pairs. You will have 2 days to complete this in class. (This actually took 3 1/2 days. We have 45 minute periods.) They will be left in class and passed back on day two. They may not leave the room. 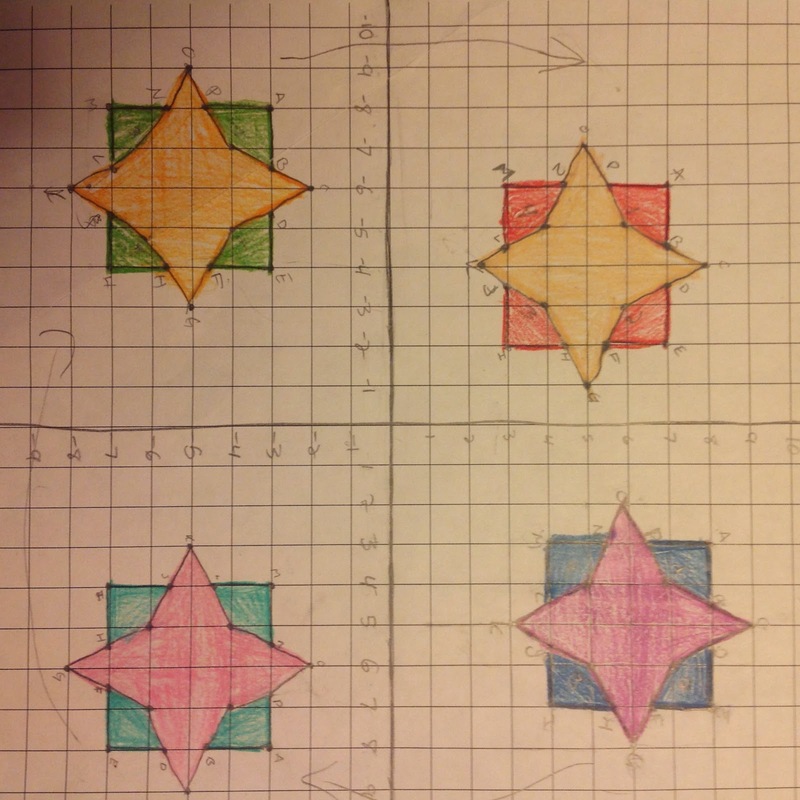 Remember to document all of the transformations and label the vertices correctly. Make sure to look at the rubric if you have questions. Here are some examples of their final products. Very creative and neatly done. This student worked so hard on her picture and getting her points exact. She wanted to give up and try an easier picture but I kept encouraging her. She did a great job and was so proud of herself! I like the color coding on this one. You know what this student was thinking about. 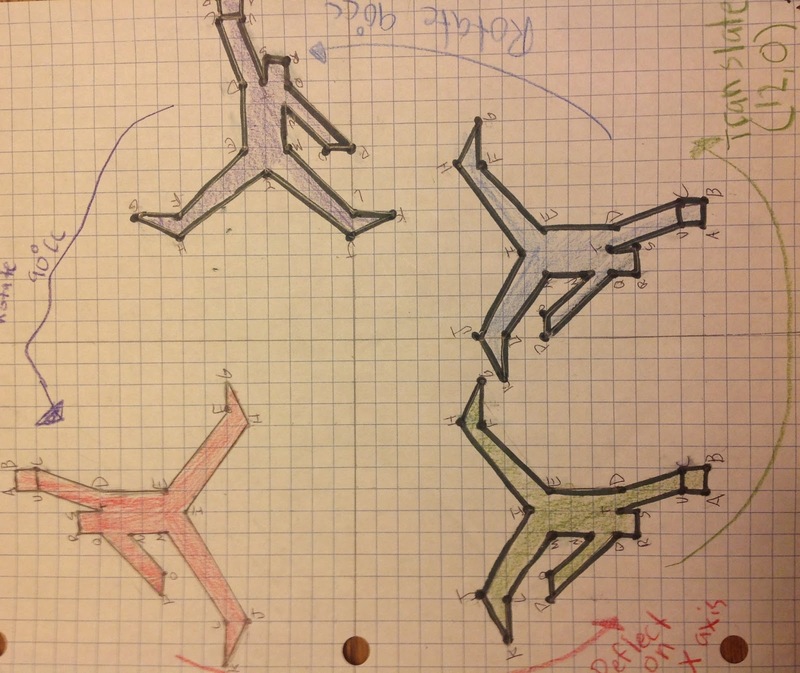 This is a great picture but this student did not list the transformation or show arrows to depict the movements. Still it is so pretty I had to show you. I've included the documents for the lesson below. I'm not the greatest at writing rubrics so it isn't the best. Feel free to change it and send me a copy. If you do, that would be awesome. Enjoy! This is the last post of this year. Where did 2014 go??? Great assessment. Thanks for sharing! I am glad that you like it. It was a fun assessment. Thanks Deanna for taking the time to stop by and write a comment. especially if the student can Google it lol. Thank you for the comment. I have removed the answers from this post so students can't copy them. Great point and thanks for stopping by. Students can Google the answers to anything these days. The entire curriculum I use (class work, homework, unit tests, etc.) can be found in a thousand different places on the internet. I don't think posting this project is a big deal, especially considering it is clearly intended to be done completely in-class. If any student actually did find it, consider it a teachable moment to talk about plagiarism. BTW, I love this and am excited to try it in my classroom. Thank you for sharing! I'm so glad that you had fun with this project. My students loved it and I will keep doing this for many years to come. Great project! Thank you for posting. Hope you students enjoy it! 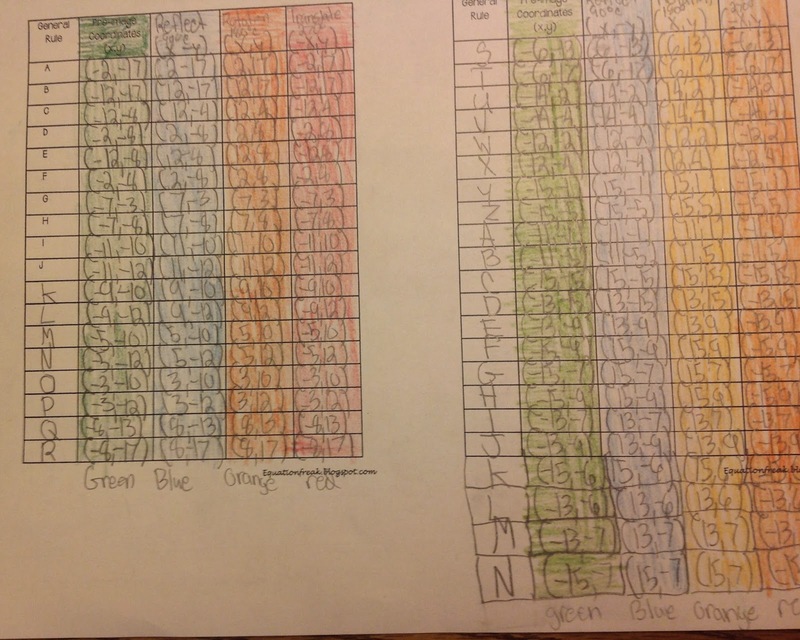 Can I have an example on how you asked them to color-code their coordinates on the Transformation Summative sheet? 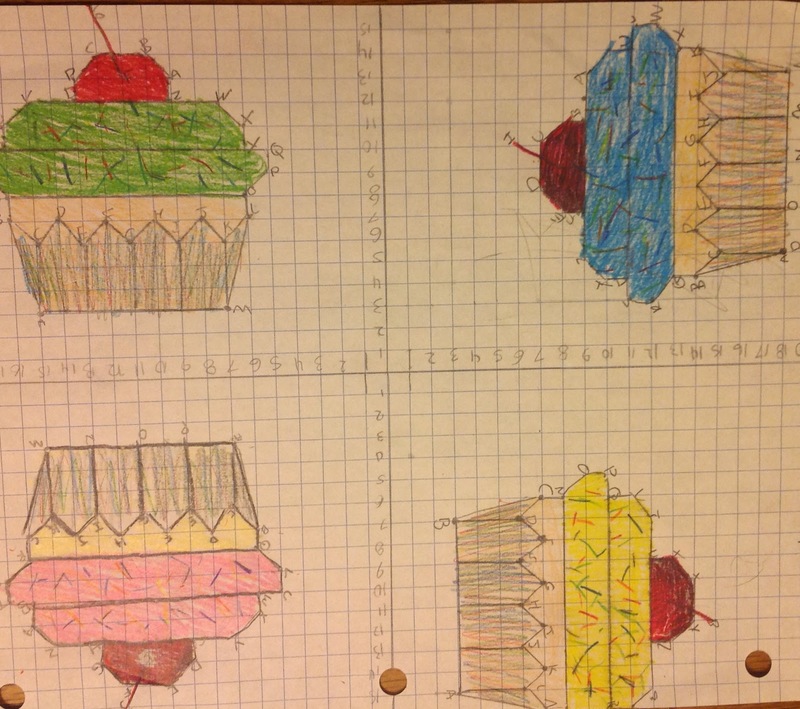 Curious on how they would color-code their coordinates if the picture involves different colors. Here's what I'm referring to: "You will also color code the images and ordered pairs. (Again, just like we did in class.)" 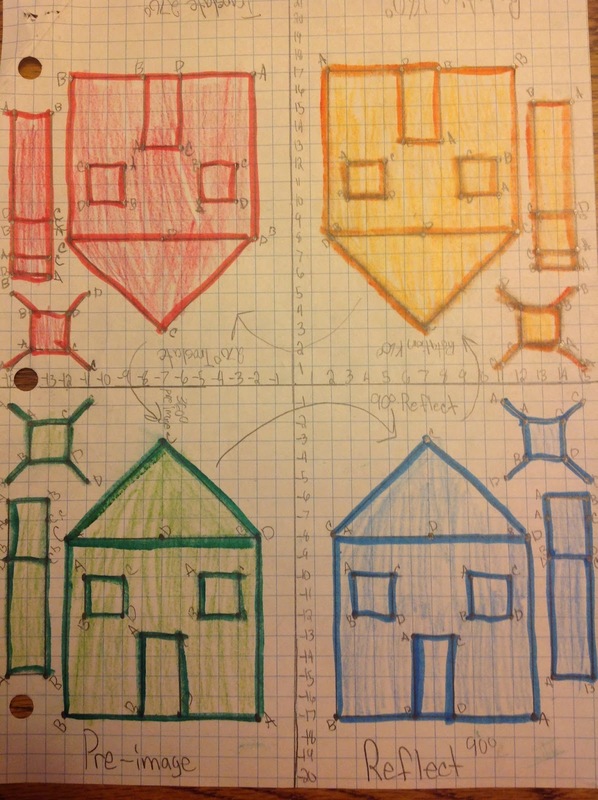 The students were to make each of the pictures different colors and then write the ordered pairs that corresponded with those points in the same color pencil or pen on their data sheet. Hope that helps. Enjoy! I love this project! I'll be doing it this week before Thanksgiving. Thanks for sharing. Your students will love it! I will be doing this right before Winter break and it will be the third time I have used it. They really enjoy it. Thanks for leaving a comment. Thanks for sharing! I plan to use it Fri-Tue before Thanksgiving break! I had come up with a similar project but I like the idea of them having to come up with the image themselves and making it consist of at least 10 coordinates. It is a great project to do before a vacation break! They are all busy working and the great thing is they can't copy. Enjoy. Thanks for sharing! I've been looking for something that can be modified to use Matrix transformations to manipulate the pre-image into a rotation, translation, and reflection. This will be very easily adaptated! I am also going to include a dilation. I am going to add dilations to my project this year as well! I'm glad you can adapt this to use with your classes. Thanks for stopping by. Do you have an example of one with a dilation? Where did you have them do this? How did you change the rubric? I love this activity! Thanks! This activity was done in the classroom and the students could not take it out of the room. That gave me the control of not having anyone just go copy from other students and I used this as a summative assessment. Somewhere in my files I have a short project over dilations. I will have to see if I can make a post on it. I'll let you know when it is up. Thanks for stopping by. I think your students will enjoy this project. Thank you. I hope you enjoy the project! My students usually get a snack in the mornings, and of course, they would usually give me a reminder. Not so today...they were completely engaged :)! Yeah! I assigned this to my Grade 6 math class, and while negative integers are not included in the Grade 6 curriculum, they grasped it pretty quickly. A few are almost finished with the drawings, they only need to populate the chart with the coordinate points. Thanks a million. You just made me smile. I love it when students are engaged with math and having FUN as well. I hope this is an activity you will be able to use for many years. Thanks for stopping by and leaving a comment. I love this but i wish the coordinates came with it. Then you wouldn't have the fun of creating your own pictures! Hope your students enjoy the project. My students loved it! Thank your for sharing! This is great. Awesome assesment! Do you have to colour each image a different colour?